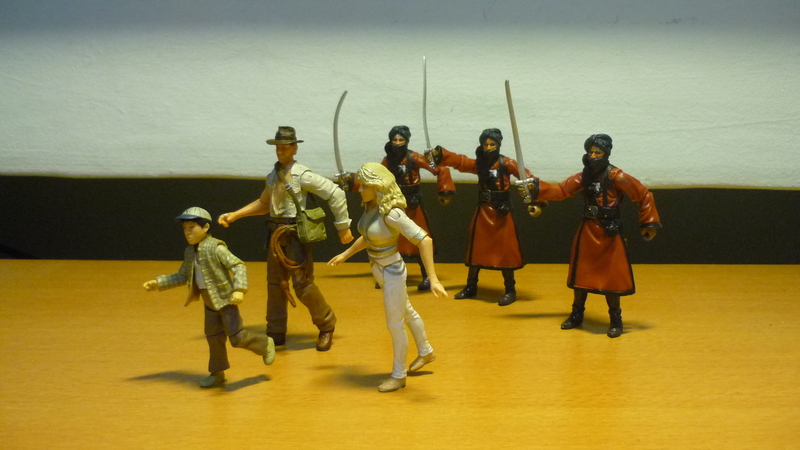 Back to your regular custom Indiana Jones figures showcase! Colonel Dietrich served as the Nazis’ liaison with French archaeologist René Belloq when in 1936, Belloq was hired by the Nazis to search for the lost Ark of the Covenant, an ancient artifact of immense power. Dietrich was intently focused on his goal of obtaining the Ark for Der Führer, and was annoyed by Belloq’s frequent dalliance with Indy’s girlfriend Marion. After the Nazis had obtained the Ark, Belloq’s plan to perform a Jewish ritual to open the Ark greatly disturbed Dietrich. Nonetheless, Dietrich went ahead with it, aware that he needed to be sure that it was the actual genuine Ark that is going to be delivered to Hitler in Berlin. 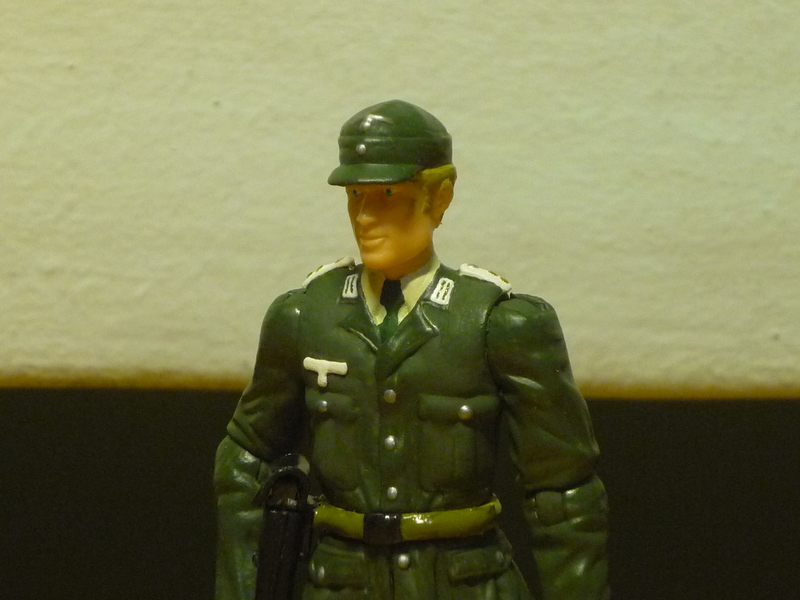 Most parts of Colonel Dietrich come from the German Soldier, only that I needed to find a face with the best resemblance to Dietrich. And that I found in the Imperial Officer from Star Wars, which was rather apt since in Star Wars lore, the Galactic Empire was said to have emphasized on Human supremacy and subjugated non-Human species to slavery. The Imperial Officer also fits into my requirements of a blond, blue-eyed Aryan for Dietrich. 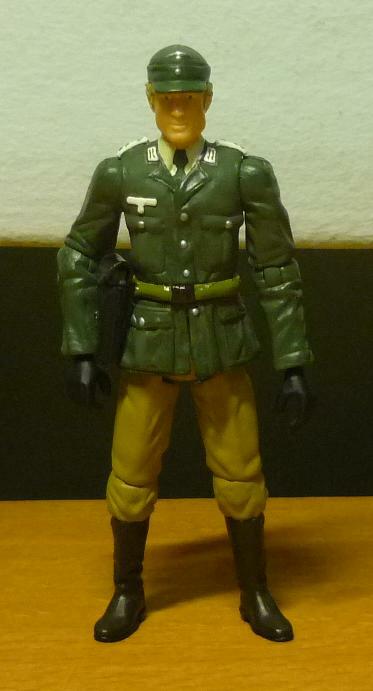 Epoxy was used to sculpt the collars and tie, and the eagle insignia on the cap. To save myself the trouble of painting the hands black, I decided to transplanted over a pair of already-black gloved hands that I had as spares. The trouble with painting hands is that you have to consider whether the figure would be holding anything (such as guns), and therefore the palms should not be painted since any paint painted there will be worn off. Also, I have discovered that acrylic flat black color tends to grow mold easily and is a rather undesired color, if possible just use existing black parts. It’s all in the details. True to his onscreen appearance, Dietrich’s scar has been painted onto his left cheek. Belloq dons a ceremonial outfit as he prepares to open the Ark. Dietrich and Toht stand close, eager to learn its secrets. The Ark has been opened! The Ark Ghosts emerge and inflicts the wrath of God upon the Nazis. Dietrich’s head is sucked inside out, Toht’s face melts away, and Belloq’s head explodes in a column of fire. 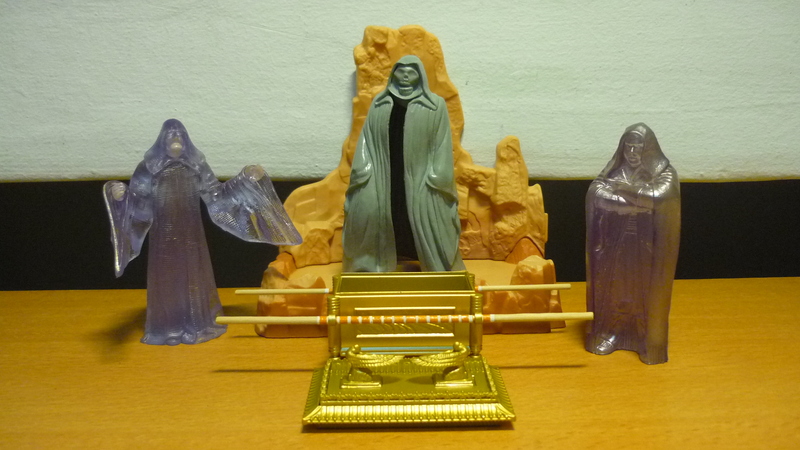 Here we have the special appearances of Holographic Darth Sidious and Darth Maul, standing in as Ark Ghosts. You know, Godzilla isn’t the only monster that’s on my mind nowadays. As part of my effort to complement my awesome Indiana Jones collection, I am also on the lookout for other figures or playsets that I find compatible with my Indy figs. 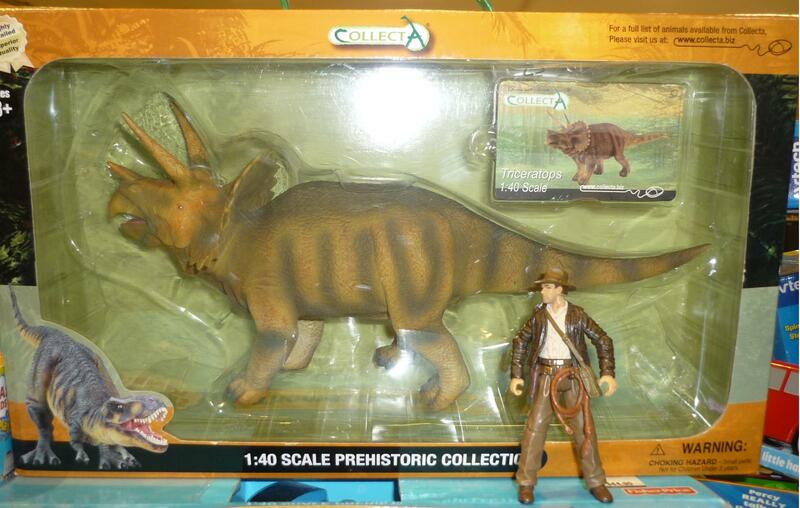 Usually they are of the same 1:18 (or 3.75 inch) scale, or belong to the same time period as Indiana Jones (early 20th century, or WW2). For this showcase I feature something that I have acquired, which was rather inspired by an Indiana Jones novel that I had recently read. 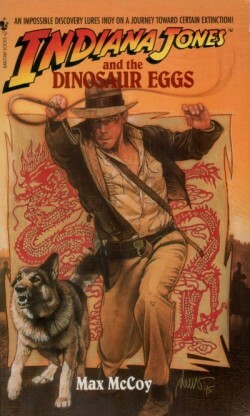 In the novel “Indiana Jones and the Dinosaur Eggs”, Indy embarked on an expedition to Mongolia in search of a living dinosaur which has survived into the modern age, all the while pursued by cannibalistic Mongol bandits. For the story, the mythical “Mongolian Death Worm”, which everyone in Mongolia believes it really exists, was revealed to be the three-horned dinosaur the Triceratops, whose skin is “so poisonous that even to touch it means instant death”. 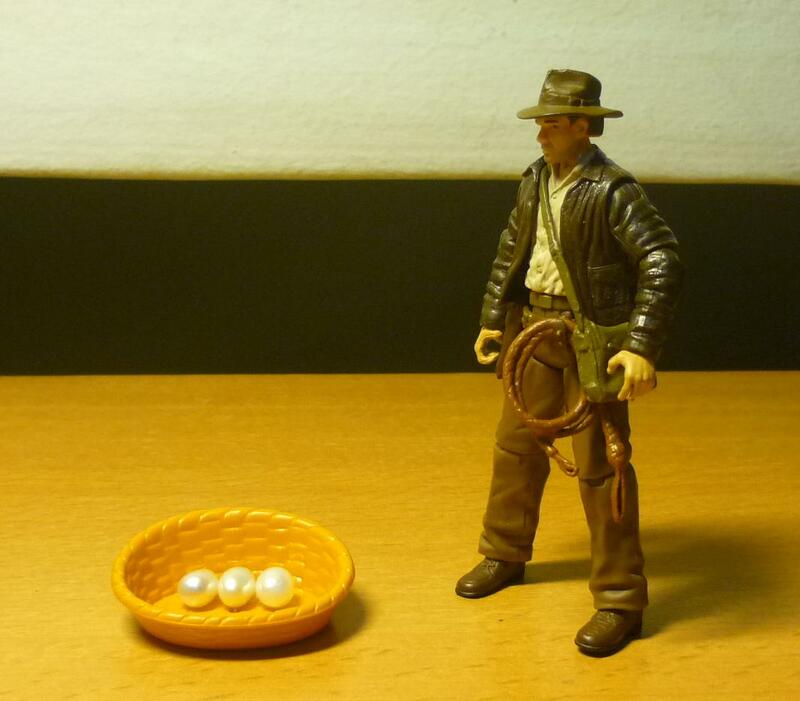 Indy finally locates three living Triceratops eggs, but only one egg survives the chase by the Mongol bandits. The egg then hatches to a baby Triceratops, which Indy decides to leave it in the hidden paradise instead of taking it to the outside world to be studied by science. 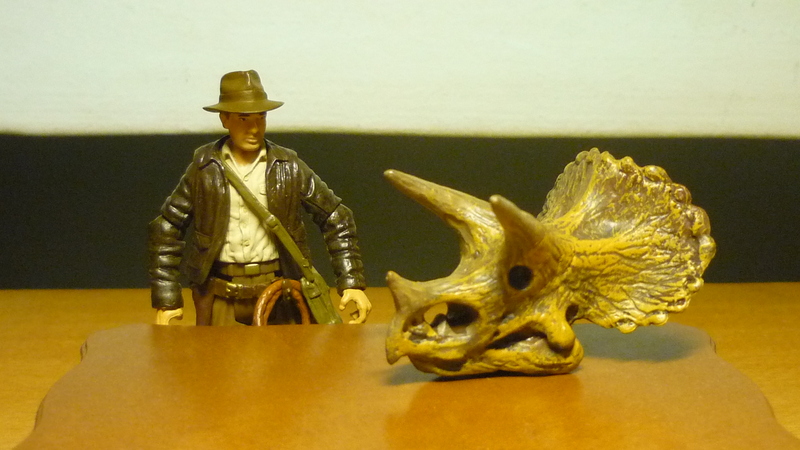 Upon reading the book, I remembered that I had previously bought a set of miniature dinosaur skulls which I thought would have fit in an Indy figs-sized museum, and among them was a Triceratops skull. 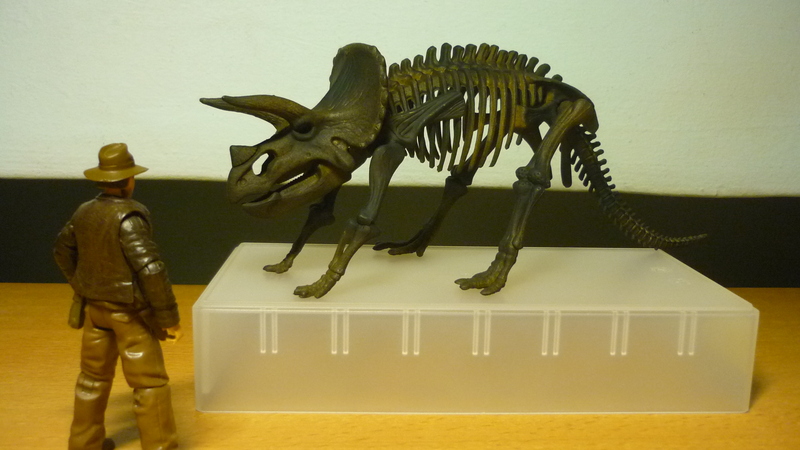 During my Hong Kong trip, I found a piece-it-yourself Triceratops skeleton at the airport. 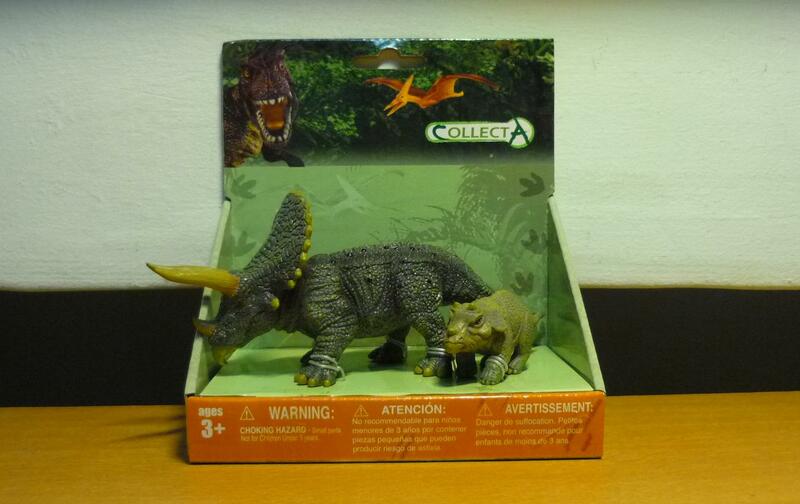 And recently a series of dinosaur figures came on sale at local department stores, and being still inspired by the Indiana Jones story that I had read, I acquired a set of adult and baby Triceratops. Also on sale is a larger sized and more appropiately scaled Triceratops, which I seriously contemplated on whether to acquire likewise. But considering that in the story, no adult Triceratops actually appeared, but only the Baby Triceratops, I decided not to buy this monster. I can still do that, but it would have been way too much fun. Hi world! 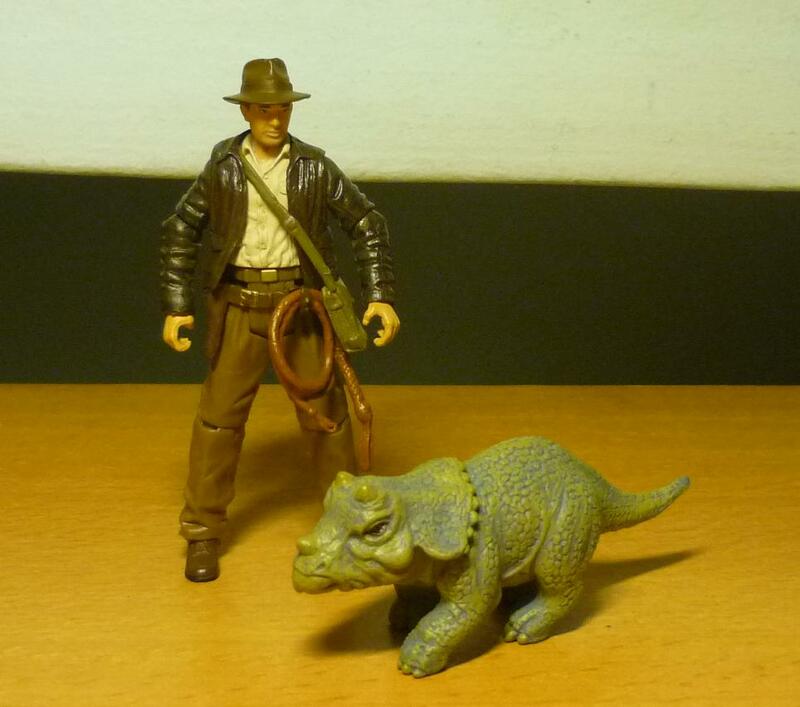 Here’s my latest custom Indiana Jones figure. The Thuggees have decided to sacrifice Willie Scott to their goddess Kali. Willie was about to be lowered into the lava pit, when Indy was aroused from the black sleep of Kali just in time to beat up the believers and free Willie from the pit. After Indy, Short Round and Willie have released all the child slaves from the mines, the trio were forced to escape through the tunnels while being pursued by dozens of Thuggee zealots. 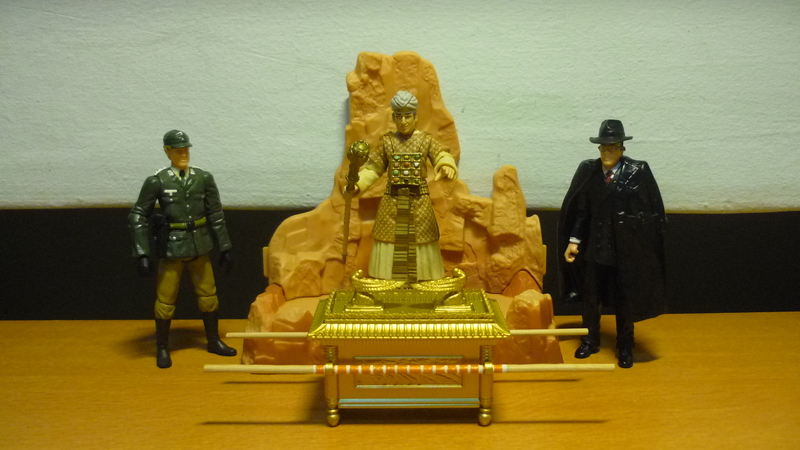 A recent trip to Hong Kong has allowed me to acquire an additional Willie Scott figure, and I’ve decided to customise a Willie Scott based on her appearance during the escape from the Temple of Doom. And the reason why I wanted to make this figure is because only a few simple steps are required for this custom. The original Willie figure comes with a pair of legs underneath her white dress, and the legs were sculpted in great detail as there were also the straps that were dangling from the belt on her hips. The dress was sliced off from the belt, and as there wasn’t much of a waist, epoxy was used to sculpt the waist below her belt. The legs were then painted white, with the straps painted silver. The only drawback is the lack of articulation for the legs – the knees can’t bend, and the feet cannot swivel. Other tasks involved removing the veil and touching up the hair with epoxy and paint, and slicing off the bangles from the wrists. And she’s done! Comparison between the original Willie Scott figure (left), and Temple Escape Willie (right). 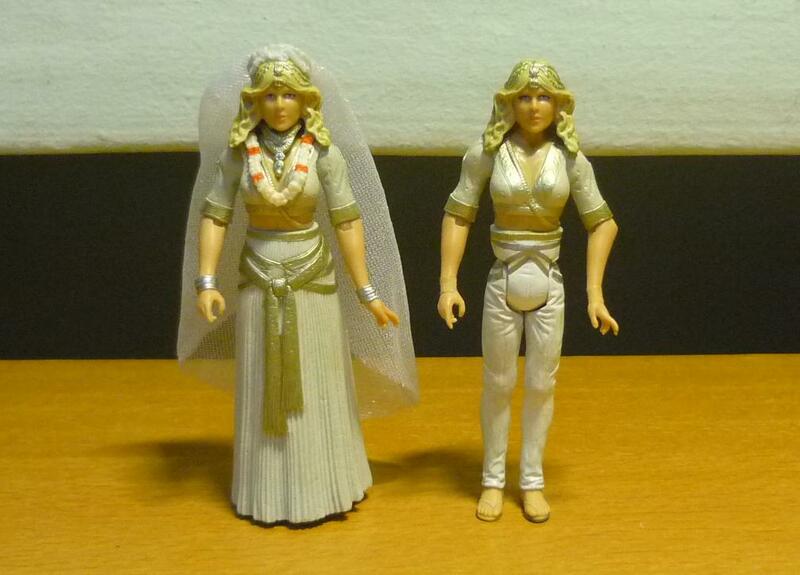 Willie seems to have ripped off her own dress when escaping from the Temple of Doom. Even the straps were exquisitely sculpted onto her hips. Indy and gang on the run from the Thuggees.